Hubli Mahajan Celebrates 100 years of Shree Ajitnat Jain Derasar. 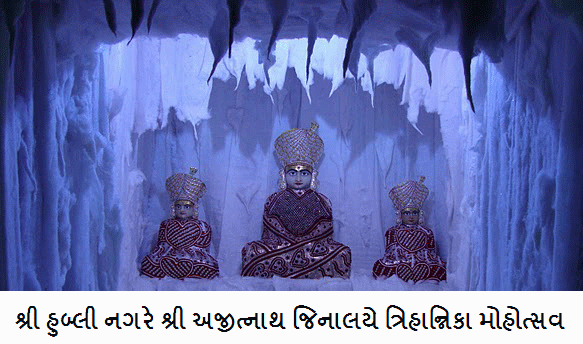 The Glorious Trihanika Shataabdi Mohotsav of Shree Ajitnath Jain Derasar was held from 24th of December 2009 to 28th of December 2009. A series of programmes were being organised to mark the celebrations. Nearly a thousand Gnatijans from all over nation participated in the celebration. Various committees like transport, accommodation, procession etc were formed to ensure that the function moves smoothly. A total of 120 volunteers worked together to see that all the enlightening events are carried out successfully. The unity and the cooperation between the committees made the whole function a memorable one. The long awaited Mohotsav started with a Mangalmaye Subh Arambh with Shree Parswnath Panch Kalyank Pooja at 3:00 p.m. The second day commenced with a very pious Shree Sidh Chakra poojan at 8:30 a.m. The third day of the mohatsav was celebrated with Shree Adhaar Abhishek Pujan at 8:00 a.m. followed by a glorious Nagar Dharawali (Vargodo) with Dhwaja Darshan at 2:30 which ended by 6:00 p.m. The procession was filled with over 1200 people who led Shree Pratimaji towards the temple. This nagar dharawali and dhawja darshan was worth watching and appreciated not only by our gnatijans but by people of all castes and creeds. Fourth day of the mohotsav was Organised with Shree Satarbhedi Pujan and dhwaja Rohaan at 8:00 a.m. This event too was celebrated wonderfully which made the day very memorable. Jinalye dwar utgaatan was organized at 5:30 a.m. followed by a maanglik prawachan by Marashahebji. With this the Glorious celebration gained completion. All the vdhividhaan was organized by Shree Narendrabhai Nandu and Music was organized by Shree krishnakant thakkar and his group.Each and every day of mohatsav was added with Navkasi, saadarmik bhakti, chouviaar and Bhakti Bhavna in the evening hours.